Professional service at your door! A great feature of these kind of water heaters is its size. A traditional tank heater takes up 13 sq. ft of space. An outdoor mounted heater takes up 0 sq ft of in-home space. We recommend outdoor installation. Our pumping systems have been approved for 6 points of EPA Energy Star water heating credits. They save on both energy and water. This pump also helps to preserve the warranty on your Orange County tankless water heater. We have several ways to install different types of pumping systems. Grundfos pumps can be installed with a small electric tank so recirculation does not flow through tankless unit allowing tankless warranty to remain intact. Some manufactures have pumps and storage tanks built in to the unit such as Navien. Why wait for hot water! Remember tankless water heating is an endless supply of hot water. But not instant. If you currently wait for hot water, this will not change unless you allow us to install a demand pump. These pumps can be installed with a push button system or a seamless motion sensor. Our Professional ET 7000 Series Water Softeners and whole house filters are considered to be the best in the industry. These systems will not only make your skin softer, they eliminate hard water scale residue on shower doors, faucets/fixtures and in toilet bowls. Orange County Tankless Done Right’s softeners systems are designed to meet all the plumbing codes in Southern California. They are full ported and will not decrease water pressure in your home or business. We all know how important water treatment is to Tankless hot water heaters, but it is often overlooked due to the additional cost. Now there is a simple, low cost way to protect and extend the life of the unit. This is a maintenance procedure much like cleaning a coffee maker. If you have a softener, descaling is not necessary. If not, we recommend at least 1 time every 2 years. The frequency will depend on the hardness of your water, the temperature setting and quantity of hot water used. Remember… We are trained in installation and service from Bosch, Noritz, Rinnai, Rheem, Navien, Takagi, Eternal and Paloma tankless units. Any problems with a unit can be rectified by us here at Orange County Tankless Done Right – We are leaders in both installation and repair of tankless units! We are a Noritz distributor and certified installer, but we can install any kind of water heater. This is a great way to lower your utility bill and gain precious space in your home. You will have more comfort because you will never run out of hot water. We want to bring a “little green” in to your home or business. With a Tankless Done Right water heater system, you will save on your energy costs and have unlimited hot water. No more running out of hot water while running multiple appliances or taking extended showers. The water is always hot and always ready. 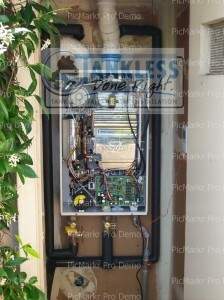 Noritz tankless water heaters are also a true “green” product. They only burn gas when you need hot water, unlike a conventional heater that runs all day to keep hot water in the tank. This translates to savings on your energy bill while producing less environment damaging greenhouse gas emissions. You will see the savings on your gas bill very quickly, in some cases up to 50%, Most developed countries use tankless water heaters. This is not a new idea. As energy becomes priced globally the need to conserve will grow. While the technology of a tankless gas water heater is highly advanced, it’s not brand new. It’s actually been around for over 40 years. In fact, the first tankless gas water heater was introduced back in 1966, in Japan where this all started. The technology has advanced throughout the years and the current industry average for tankless water heaters is 83 percent efficiency. Noritz America just recently released its new condensing unit which has a 93 percent efficiency, using as much of the energy consumed to heat water. With such high efficiency the amount of CO2 emitted is reduced by 14 percent, eliminating a significant amount of greenhouse gases that enter the atmosphere. Being an On-Demand system, tankless gas water heaters only heat water when a demand for it is present. When hot water isn’t in an idle state saving energy and costs for its owner. Without a need for standby heat, energy consumption can also be reduced by 20 percent to 30 percent with a tankless water heater. In fact, the total energy savings with a tankless gas water heater can mount up to 50 percent. Save up to $1,500 (30% of purchase & installation) with Federal Tax Credits for Qualified Bosch Tankless Water Heaters by Orange County Plumbing & Tankless Done Right. Energy Efficient Bosch Water Heaters Can Save You Money On Your Taxes In Addition To Year-Round Savings on Your Energy Bill. 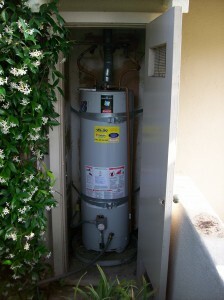 2009 signifies the return of a federal tax credit for non-solar tankless water heaters under the Energy Policy Act of 2005, which expired at the end of 2007. This successful program was extended under the “American Recovery and Reinvestment Act of 2009.” The act re-establishes tax credits for purchasing and installing energy efficient home improvements, such as a Tankless Water Heater. Full guidelines for the Tax Credit can be viewed on the Energy Star website. Home improvement tax credits are available for energy-saving home improvements placed in service from January 1, 2009 through December 31, 2010. Any home improvements made in 2008 are not eligible for the tax credit. Home improvement tax credits are available for insulation, replacement windows, non-solar water heaters, and certain high efficiency heating and cooling equipment. The maximum amount that a taxpayer may claim from all of these tax credits combined is $1,500 for the two years of the tax credit (2009 and 2010) Some improvements such as geothermal heat pumps, solar water heaters, and solar panels are not subject to the $1,500 maximum. If you are building a new home, you do not qualify for the tax credits for “eligible building envelope components” (windows, doors, insulation, roofs) or “qualified energy property” (HVAC & non-solar water heaters). However, the tax credit for photovoltaics, solar water heaters, small wind systems, and fuel cells is available for homeowners building new homes. Internal Revenue Service (IRS) guidance for consumers can be viewed here: IRS Notice 2006-26 [PDF]. Note: You may be eligible for these Federal Tax Credits and SoCal gas rebates. Please consult your professional Tax consultant for more information.